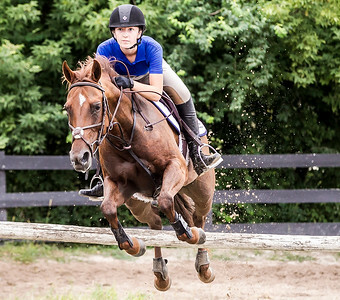 Sarah Nader - snader@shawmedia.com Natalie Hinz, 16, of Crystal Lake jumps during a training session at Valley View Acres in Woodstock Thursday, August 26, 2016. HInz lost her first horse in the fire at Valley View Acres in 2014. It was among 32 horses killed in the fire. 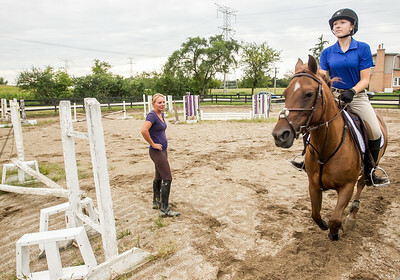 A stranger from Wisconsin donated a new horse to Hinz, which she rode in a national equestrian championship this year in Lexington, Ky.
Sarah Nader - snader@shawmedia.com Amber Bauman (left), trainer and stable owner, watches Natalie Hinz, 16, of Crystal Lake during a training session at Valley View Acres in Woodstock Thursday, August 26, 2016. HInz lost her first horse in the fire at Valley View Acres in 2014. It was among 32 horses killed in the fire. 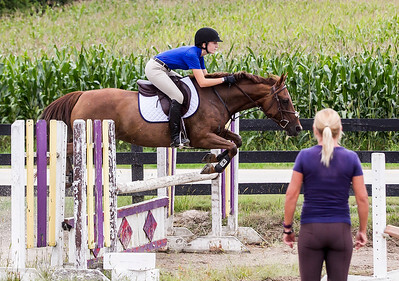 A stranger from Wisconsin donated a new horse to Hinz, which she rode in a national equestrian championship this year in Lexington, Ky.
Sarah Nader - snader@shawmedia.com Natalie Hinz, 16, of Crystal Lake during a training session at Valley View Acres in Woodstock Thursday, August 26, 2016. 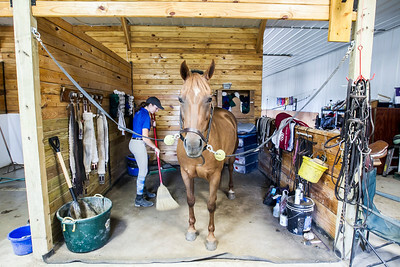 HInz lost her first horse in the fire at Valley View Acres in 2014. It was among 32 horses killed in the fire. 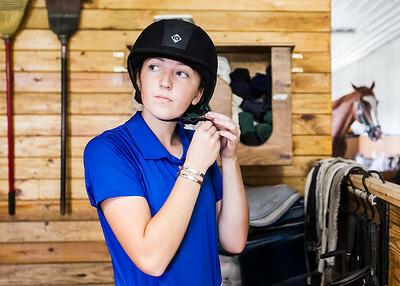 A stranger from Wisconsin donated a new horse to Hinz, which she rode in a national equestrian championship this year in Lexington, Ky.
Sarah Nader - snader@shawmedia.com Natalie Hinz, 16, of Crystal Lake gets ready before a training session at Valley View Acres in Woodstock Thursday, August 26, 2016. HInz lost her first horse in the fire at Valley View Acres in 2014. It was among 32 horses killed in the fire. 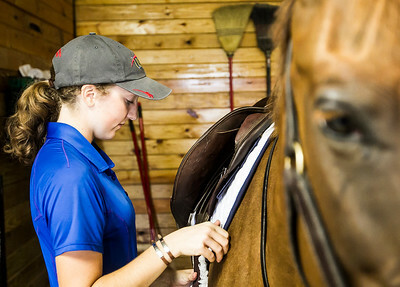 A stranger from Wisconsin donated a new horse to Hinz, which she rode in a national equestrian championship this year in Lexington, Ky.
Sarah Nader - snader@shawmedia.com Natalie Hinz, 16, of Crystal Lake preps her horse before a training session at Valley View Acres in Woodstock Thursday, August 26, 2016. HInz lost her first horse in the fire at Valley View Acres in 2014. It was among 32 horses killed in the fire. 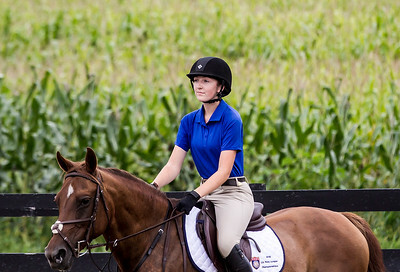 A stranger from Wisconsin donated a new horse to Hinz, which she rode in a national equestrian championship this year in Lexington, Ky.
Sarah Nader - snader@shawmedia.com Natalie Hinz, 16, of Crystal Lake rides during a training session at Valley View Acres in Woodstock Thursday, August 26, 2016. HInz lost her first horse in the fire at Valley View Acres in 2014. It was among 32 horses killed in the fire. 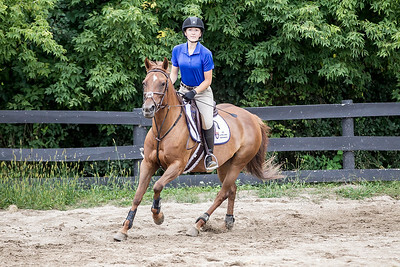 A stranger from Wisconsin donated a new horse to Hinz, which she rode in a national equestrian championship this year in Lexington, Ky.
Natalie Hinz, 16, of Crystal Lake rides during a training session at Valley View Acres in Woodstock Thursday, August 26, 2016. HInz lost her first horse in the fire at Valley View Acres in 2014. It was among 32 horses killed in the fire. 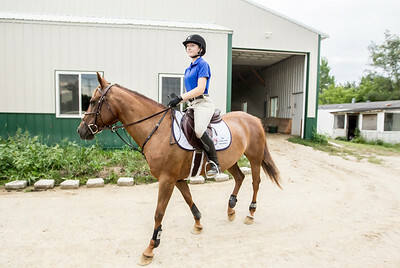 A stranger from Wisconsin donated a new horse to Hinz, which she rode in a national equestrian championship this year in Lexington, Ky.